Teacher 1: "I'm having real problems with my class. They keep helping each other when I want them to work independently. They touch each other, can't seem to keep their materials to themselves, and every time I ask them a question about a fact, they answer with a story about their family!" Teacher 2: "It must be a cultural thing." Teacher 1: "What does culture have to do with classroom management? I have to get the kids to behave and learn!" What does culture have to do with classroom management? As it turns out, it has a lot to do with it! 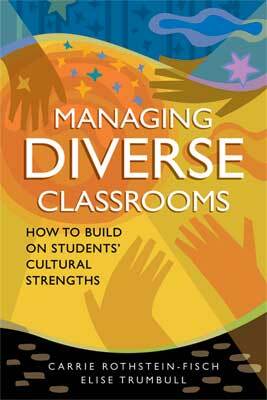 The goal of Managing Diverse Classrooms is to look at the impact of culture on classroom organization and management. Throughout this book, we examine how teachers equipped with a framework for understanding cultural differences have constructed novel ways of organizing their classrooms. One of the most common concerns of teachers is how to manage a classroom full of students (Evertson & Weinstein, 2006). After all, if the classroom is in chaos, how can learning take place? In this book, we suggest that, in order to make good decisions about classroom organization and management, teachers need to understand the role of culture in human development and schooling. Understanding the role of culture does not mean learning endless facts about a great many cultures, but rather coming to see how culture shapes beliefs about learning and education. When teachers understand cultural differences, they begin to re-examine and redesign their classroom organization and management in many fruitful ways (Trumbull, Rothstein-Fisch, Greenfield, & Quiroz, 2001). As a result, teaching and learning become easier. In this chapter, we lay the foundation for the innovations described throughout the book. We briefly define classroom management and culture so as to be explicit about what we mean by our terminology. In particular, we describe the intersection of classroom management and culture. Next, we introduce the individualism/collectivism framework—the system for understanding cultural differences that underlies all the innovations described throughout the book. Finally, we describe two important studies that demonstrate how cultural value systems of individualism and collectivism can influence school settings. What Do We Mean By Classroom Management? In Figure 1.1 we define the terms used throughout the book. Both classroom organization and classroom management have the ultimate goal of making the classroom environment hospitable for learning. We agree with Weinstein's (2003) observation that "the fundamental task of classroom management is to create an inclusive, supportive, and caring environment" (p. 267). Organization, especially the social organization that includes how students communicate and interact with each other and the teacher, is also a key to an inclusive, supportive, and caring environment. Every choice a teacher makes about organization or management reflects a cultural perspective, whether it is visible or not. Likewise, the teacher's choices will affect students in different ways, depending upon how the children have been socialized within their home cultures. Thus, "effective classroom management requires knowledge of cultural backgrounds" (Weinstein, 2003, p. 268). Such knowledge is essential also to the development of caring relationships and the interpersonal skills needed to interact effectively with both students and their families. What, exactly, is culture? Our way of thinking about culture has been called a "cognitive" approach to culture because we are interested in the deep elements of culture related to thinking, teaching, learning, and making meaning (Fetterman, 1989). We define culture as "the systems of values, beliefs, and ways of knowing that guide communities of people in their daily lives" (Trumbull, 2005, p. 35). The concept of "systems of values and beliefs" is central to what we describe later in this chapter—the cultural values framework that has proven effective in helping teachers learn about two differing cultural values systems. By "ways of knowing," we mean how people organize their world cognitively through language and other symbol systems. It includes how they approach learning and problem solving, how they construct knowledge, and how they pass it on from generation to generation. Culture is manifest in how groups of people carry on in their daily lives. For example, some people like to stay together as a family for all kinds of weekend activities, whereas others prefer to "do their own thing." These are not just matters of personal preference, but are guided by cultural values, as we will see. How Is Culture Involved in Organization and Management? Questions of organization and management are, ultimately, questions of what is valued in a particular setting (Evertson & Randolph, 1995, p. 19). What happens in the classroom is primarily reflective of the cultural values of the school and the teacher. For example, "[w]hat teachers consider to be 'discipline problems' are determined by their own culture, filtered through personal values and teaching style" (Johns & Espinoza, 1996, p. 9). Of course, there are differences in teachers' instructional and management styles (Walker & Hoover-Dempsey, 2006), but the underlying values motivating teachers' behaviors are likely to be quite similar. This similarity results from two observable facts: (1) the majority of teachers are European American and implicitly hold dominant-culture values (Gay, 2006); and (2) most "other" teachers have been educated in U.S. schools, and in that process, they have been taught "the right way" to teach and manage the classroom. For this reason, teachers from nondominant cultural groups have often learned to suppress their intuitive cultural knowledge in favor of the "best practices" that they learned in school (Hollins, 1996; Lipka, 1998; Trumbull et al., 2001). The examples that fill these pages come from the Bridging Cultures Project, a collaborative action research project involving seven elementary school teachers in classrooms with large numbers of immigrant Latino students. Unlike most teacher training interventions that are short term, the Bridging Cultures Project has been a longitudinal professional development and research endeavor. The project began with three professional development workshops completed in four months, and it continued with a series of whole-group meetings, classroom observations, and interviews over a period of five years. Although the project is described in detail elsewhere (Trumbull, Diaz-Meza, Hasan, & Rothstein-Fisch, 2001), readers of this book will benefit from knowing about the participants, the school's demographics and contexts, and the Bridging Cultures approach to classroom organization and management. Professional researchers. Four professional researchers collaborated to develop and carry out the project: Dr. Patricia M. Greenfield, a professor of Cross-cultural Psychology at the University of California, Los Angeles; Dr. Greenfield's graduate student, Ms. Blanca Quiroz (now Dr. Quiroz is an assistant professor at Texas A&M University); Dr. Carrie Rothstein-Fisch, associate professor of Educational Psychology and Counseling at California State University, Northridge; and Dr. Elise Trumbull, an applied linguist and, at the time, senior research associate with WestEd, the regional educational laboratory based in San Francisco. Teacher-researchers. The seven teachers in the Bridging Cultures Project were all teaching in bilingual (Spanish-English) elementary school classrooms and had an interest in multicultural education. They all had ample teaching experience, ranging from 5 to 21 years, with an average of 12.7 years. Four of the teachers are Latino, and three are European American. Two teachers were born in Mexico, one in Peru, and one in Germany, although all of these four had immigrated to the United States between the ages of 2 and 8. The other three teachers were born in the United States. Six teachers are female, and one is male. As a fortuitous bonus, the teachers represented all grade levels from kindergarten through 5th grade, and this remained true throughout the project, even with changes in grade assignments for the first four years. Three of the teachers have master's degrees (two in education, one in fine arts), and two were highly involved in the Los Angeles Unified School District's Intern Program as mentor teachers. During the course of the project, two teachers earned their National Board for Professional Teaching Standards Certification. These were not average teachers! However, they were perfect candidates to help us understand and apply the framework of individualism and collectivism to educational practice in the real world. We use the teachers' real names throughout this book because it contains their teaching and learning innovations. They are Marie Altchech, Catherine Daley, Kathy Eyler, Elvia Hernandez, Amada Pérez, Giancarlo Mercado, and Pearl Saitzyk. The participant selection process deserves some description. Teachers were recruited specifically because they were identified as being interested in learning more about their Latino students. We mindfully selected teachers committed to bilingual and multicultural education (and willing to give up three Saturdays for a modest stipend) in schools serving a large student population of poor immigrant Latino students from Mexico and Central America. Experience with this particular population turned out to be very important because evidence indicated that immigrants from these areas might be among the most collectivistic students in the United States (see Goldenberg & Gallimore, 1995; Greenfield, Quiroz, & Raeff, 2000; Raeff, Greenfield, & Quiroz, 2000; Valdés, 1996). This fact would increase the likelihood that knowledge of the individualistic and collectivistic systems would provide teachers with an immediate context for applying new content knowledge to a population that might benefit most. Our hypothesis was that if the framework were useful for committed teachers working with a population who had experienced conflict in cross-cultural values, then they would be able to construct meaningful new classroom practices based on their knowledge of the competing cultural values systems. The seven teachers taught at six different schools. All the schools are in Southern California: five teachers taught at four schools in the Los Angeles Unified School District (LAUSD), one teacher taught in Ventura County (about 60 miles north of Los Angeles), and one teacher taught in the city of Whittier (in southern Los Angeles county). The teacher from Ventura County taught at a school where a vast majority of students came from immigrant or migrant farm worker families. These children lived in the most rural area, and because of the association of collectivism with rural residence and an agricultural way of life, we consider them to be the most collectivistic of all of our classroom groups. Two of the seven teachers taught in one of the lowest-performing schools in Los Angeles, based on standardized test scores. Two other schools were located in high-crime, urban neighborhoods. Overall, the purpose of the project was to foster culturally responsive teaching and learning opportunities for immigrant Latino students and their families, the population served by the participating teachers. The project used a cultural values framework to see if teachers' understanding of the deep meaning of culture would have implications for teaching and learning. The Bridging Cultures Project emphasized two things: (1) supporting teachers to deepen their knowledge of cultural values systems and the role of those systems in human development, schooling, learning, and teaching; and (2) offering teachers an opportunity to adopt "a self-reflective stance whereby the contribution of their own attitudes, values, and taken-for-granted cultural patterns" (Bowers & Flinders, 1990, p. 7) and those of their schools can be examined. It was this combination of a powerful but accessible cultural theory and the innovations of the Bridging Cultures teachers that motivated us to write this book. I wanted to understand my students better, so I started studying Mexican culture. Then I realized that the children in my class came from so many distinct regions of Mexico, Central and South America, each with differing histories and traditions. I knew that I would never know enough. I had to give up trying. Though many teachers may have had at least some opportunity to learn about cultural issues in education, whether through preservice courses or professional development workshops, they are not likely to have had access to a theoretical framework that is both easy to grasp and immediately useful for understanding arguably the most important distinctions among cultures. The individualism/collectivism framework is just that. We have come to call it the "Bridging Cultures framework," but in truth sociologists and anthropologists have seen the explanatory power of the framework for more than 50 years—although they have not always used the labels "individualism" and "collectivism" (Waltman & Bush-Bacelis, 1995). Using this streamlined framework, with only two elements, the Bridging Cultures teachers were able to generate an almost endless array of successful strategies for working with the students and families they served. The framework and the examples we present should stimulate readers to generate their own innovations that make sense in their particular school communities. In fact, the framework is most useful when it is used as a guide to learn from students and families directly about the details of their own lives. Research suggests that two broad cultural value systems, individualism and collectivism, shape people's thoughts and actions in virtually all aspects of life (Greenfield, 1994; Hofstede, 2001; Markus & Kitayama, 1991; Triandis, 1989). Figure 1.2 lists some of the most important contrasts between individualism and collectivism. The fundamental distinction between these two systems is the relative emphasis placed on individual versus group well-being. "While self-realization is the ideal with many individualistic cultures, in the collectivist model, individuals must fit into the group, and group realization is the ideal" (Waltman & Bush-Bacelis, 1995, pp. 66–67). It is not a matter of valuing one or the other—individual or group—but rather the degree of emphasis accorded to each. Before proceeding further, we caution once again that every culture has both individualistic and collectivistic values. The dichotomy we present is a distillation of the "general tendencies that may emerge when the members of … [a] culture are considered as a whole" (Markus & Kitayama, 1991, p. 225). Great variation exists within a culture, just as any one person will exhibit both individualistic and collectivistic behaviors at different times. The elements that constitute culture are not separate and static but rather interactive and constantly evolving (see Rogoff, 2003; Shore, 2002). Of course, within any cultural group, individuals will vary in the degree to which they identify with particular values, beliefs, or ways of knowing. Yet it can be very useful for teachers to understand the dominant tendencies of a cultural group as a starting place for exploration and further learning. We return to these points later in this chapter. In the United States, a country known for its history of "rugged individualism," the dominant values include independence, self-reliance, individual achievement, and cognitive development. Children learn early on that they are expected to take responsibility for themselves first and foremost, and it is regarded as a healthy developmental step when young adults achieve separation from their families (Hofstede, 2001). The individualistic American views himself as someone who is "a distinct individual … capable of self-assertion and … free to think and act according to personal choice or volition" (Raeff, 1997, p. 225). Common proverbs capture this individualistic world view: "Stand on your own two feet." "Every man for himself." "The squeaky wheel gets the grease." In contrast, children from collectivistic families are socialized with values that emphasize working together interdependently rather than working alone independently (Greenfield, 1994). In Mexico, a highly collectivistic country, the dominant values are interdependence, cooperation, family unity, modesty, respect, and social development (Delgado-Gaitan, 1994; Greenfield, 1994; Tapia Uribe, LeVine, & LeVine, 1994). Personal choices are likely to be evaluated relative to their potential benefit to the family, respect for elders, and modesty about one's accomplishments. These choices are valued over self-expression. When it comes to completing a task, it is far more important to engage social relationships first, and then the task will get done (Hofstede, 2001). Once again, we can look to popular proverbs for insights into what a society values. Consider how the following proverbs reflect a collectivistic perspective: "No task is too big when done together." "Many hands make light work." "The nail that sticks up gets pounded down." Hence, both systems have advantages and disadvantages. Children from collectivistic families are socialized to work toward group rather than individual goals. They may be accustomed to working together as a group to help others with their tasks even before they consider their own assignment (Raeff, Greenfield, & Quiroz, 2000). Collectivistic families also emphasize learning embedded in a social context. In the classroom, collectivistic students help each other, and group success rather than individual achievement is the goal (McLaughlin & Bryan, 2003). When such students are placed in cooperative-learning groups, they collaborate easily. They have learned to rely on and support each other, and they have been taught not to bother the teacher with questions because that could show disrespect (Valdés, 1996). From the individualistic point of view, an academic task has value in and of itself. In the classroom, the most important thing is to get one's work done. Relationships with other students come second. But given all that we know about the collectivistic value system, it is not surprising that students from collectivistic backgrounds may be confused when their teacher tells them to pay attention to the task at hand to the exclusion of their peers (Isaac, 1999). In their minds, the relationships are paramount, and academic tasks can be completed much more easily if they help and are helped by each other. Schooling itself, even in collectivistic societies, is intrinsically individualistic in the sense that achievement is ultimately measured on the individual level. However, the individualism associated with formal education is moderated by the indigenous collectivism in countries such as Mexico (McLaughlin & Bryan, 2003), Japan (Lewis, 1995), and Israel (Ben-Peretz, Eilam, & Yankelevitch, 2006). An illustration of the differences between collectivistic and individualistic orientations is the meaning of education in the United States versus the meaning of educación in Spanish. In the United States, education typically refers to formal education in school settings. It is associated with doing well academically and demonstrating that ability through good grades. For immigrant Latino parents, the purpose of educación is much broader: to produce a good and knowledgeable person, one who respects other people and does not place self above others in importance (Valdés, 1996). Social and ethical development and cognitive and academic development are seen as integrated rather than separate (Goldenberg & Gallimore, 1995). One's social behavior in a group (such as the family or the classroom) is of paramount concern; in fact, being a respectful contributor to group well-being rather than focusing on one's own achievement is highly valued. So when immigrant Latino parents come for a parent-teacher conference, their first question is likely to be "¿Cómo se porta mi hijo/hija? "("How is my son/daughter behaving?"). A teacher may find it difficult to stifle her consternation after hearing the same question from 25 or 30 sets of parents, believing that all the parents care about is their child's behavior, when the teacher's goal is to discuss the child's academic progress. The parents and children sampled in School One were all European American, and they tended to agree with the teachers that in the case of cleaning the blackboard, a third person (such as a volunteer) should be sought. They reasoned that Jasmine had her own job to do, and her first responsibility was to complete her own task. This response illustrates an individualistic value, a primary focus on task completion over social relationships or the welfare of others. It also emphasizes the importance of choice: whether or not a person wants to help is an individual decision. School Two served immigrant Latino students and their families. An overwhelming majority of immigrant Latino parents (74 percent) selected a "helping" response to solve the dilemma, believing that the first obligation is to help others regardless of one's own individual responsibility to complete a task. In contrast, only 13 percent of the teachers responded with a "helping" solution. Similar to School One, the teachers believed that finding a third person or protecting the task's completion was most important. The students' response to help (36 percent) demonstrates that they are being socialized in the direction of the teachers and away from their parents. What do these outcomes mean? European American students, parents, and teachers responded very similarly, representing a harmony between home and school for the students in School One. But School Two showed a dramatic difference between the Latino parents on the one hand, and their children and children's teachers on the other. The cultural value of helping, so central to the collectivistic family, was being undermined by the school's individualism. By 5th grade, the students, already becoming products of their U.S. schooling, responded more like their teachers to this scenario. Thus the value of helping that was so important to parents had already begun to lose its potency, and the resolution of conflict between home values and school values shifted toward the value system of school. The individual versus the family accomplishment—"[T]he teacher's criterion for positive development was individual accomplishment; the parents' criterion was the accomplishment of the family as a whole or the child's contribution to family accomplishment" (p. 104). Praise versus criticism—The teacher tended to praise the students (and their accomplishments, to promote self-esteem), whereas parents appeared to avoid praise in favor of criticism (to encourage normative behavior—that is, not sticking out from the group). Cognitive skills versus social skills—Parents were typically more interested in their children's social behavior, whereas the teacher preferred to discuss cognitive and academic skills. In addition, when the teacher did talk about a social behavior such as talking to other students in class, she evaluated it negatively. "However, it would not necessarily be seen as negative by the parents, who might, from a more collectivistic perspective, view this form of behavior as a way to strengthen social ties among the class members" (p. 105). Oral expression versus respect for authority—The teacher considered talking in class to be valuable not only for language development but also for cognitive development. Collectivistic parents, on the other hand, tended to want their children to show respect for authority through quiet listening, thus the lack of positive response to the teacher's comments from the parents in the study. In fact, in 26 out of 28 cases, the teacher's suggestion that the students talk more was met with a noncooperative response from the parents. Parents often simply disconnected from the portions of the conversation related to that topic. Parenting role versus teaching role—The teacher advocated that parents teach their children at home, whereas the parents likely believed that academic instruction was solely the teacher's job. In 21 out of 22 times the topic came up, parents either did not respond or changed the topic. Nor did parents respond positively to the teacher's advice on parenting skills. They seemed to believe that it was their job to parent and the teacher's job to teach. The researchers suggest that perhaps "parents prefer to socialize their children in their own way at home because of a sense that the teacher's suggestions undermine rather than support their ideal child" (p. 106). No child should have to choose between family or school values and thereby lose out on crucial socialization. But how can optimal learning take place when students are conflicted about what is "right"? Recognition of this cultural tension is the impetus for this book, because when teachers act as cultural brokers, all kinds of harmonious learning and classroom organization can take place. Generalizations are risky, and dichotomous lists of cultural features can be misleading on many grounds. In the case of generalizations, naïve or incorrect inferences may be made about groups or individuals, whose histories and lives are always more complex and varied than any framework can capture. Or, as Raeff (1997) puts it, we must bear in mind that common values may "be played out in different specific forms …, shaping different goals and routes of self-development" (p. 228). So, for instance, the collectivism of Korean Canadians (Kim & Choi, 1994) will look different from that of Mexican Americans (Delgado-Gaitan, 1994). In the case of a dichotomous cultural framework, one may be led to think that the values represented by the two categories are mutually exclusive. Learning in any culture has both an independent (individual) and an interdependent (social) aspect. Human development takes place primarily through social interactions; but the nature of these social interactions varies in large part according to the cultural values of the society within which the child is developing and learning. Thus, independence and interdependence intersect in different ways within the individual, and the way they do is shaped by culture (Raeff, 1997). As we have said, the two categories represent tendencies in emphasis rather than absolute presence or absence of a given value. "Human experience is far too complex to fit neatly into any conceptual scheme. No society is all one thing or another" (Trumbull, Rothstein-Fisch, & Greenfield, 2000, p. 4). There will always be diversity within any group, even if the group members are all recent immigrants from the same state of Mexico. Despite the limitations of this framework—and, indeed, any framework is likely to have limitations—it is a good place to start in order to grasp major differences among cultures. Although cultures change over time as they come into contact with each other and as their economic circumstances change, many child-rearing values persist over time (Greenfield, Suzuki, & Rothstein-Fisch, 2006; Hofstede, 1991; Lambert, Hammers, & Frasure-Smith, 1979; Nsamenang & Lamb, 1994). For example, outward acculturation can move people toward individualistic behavior at school or work, but collectivistic values and child-rearing practices are likely to persist at home (Roman, 2006). The value orientation of collectivism is particularly robust among recent immigrants from rural and poor areas of Mexico and Central and South America, who maintain a strong emphasis on the unity of the family (Delgado-Gaitan, 1994; Valdés, 1996). Thus if the framework proved useful with this population—illuminating dramatic differences between school and home, generating ways to draw on students' strengths, and helping to avoid conflicts in the classroom—then educators could address how it might apply in settings where relations between home and school values were more subtle, such as with second-generation students or in heterogeneous classrooms. As we seek to build bridges between home and school cultures, we must not reduce complex individuals to simple categories; nevertheless, we cannot ignore the compelling influences of children's home culture on their education. "If we can remember that the framework is just a tool, a heuristic for helping us organize our observations and questions, we can avoid the pitfalls associated with categories" (Trumbull, Rothstein-Fisch, Greenfield, & Quiroz, 2001, p. 4). Taking the perspective that "every child is unique" and treating each student as an individual is, in itself, taking an individualistic perspective, thus negating the strong and powerful influence of culture. The individualism/collectivism framework has the potential to help educators make implicit cultural patterns explicit. By "naming them and by developing a theoretical understanding of the relationships between the patterns" (Bowers & Flinders, 1990, p. 20), teachers can be supported to understand the kinds of conflicts immigrant students and their families may face. This level of understanding can lead to constructive classroom practices and decisions about management and organization that build upon students' and parents' cultural strengths. In Chapter 2, we explore how the group orientation of immigrant Latino students plays out in a variety of classroom situations. We also show how teachers were able to capitalize on students' highly developed social skills to maintain a harmonious instructional environment. In many instances, teachers found that simple solutions to issues of management and organization lay right before their eyes in the cultural strengths of their students.